Three full graphic novels in one very large volume. First, Steve Austin, the iconic action hero of The Six Million Dollar Man, returns! 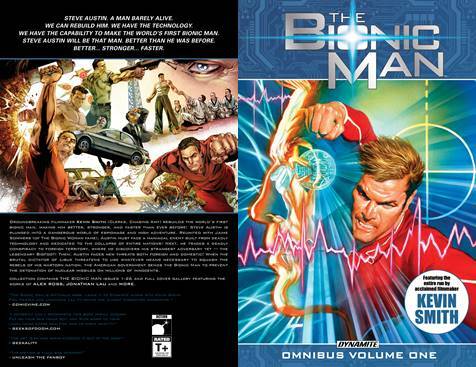 Groundbreaking filmmaker Kevin Smith (Clerks, Chasing Amy) rebuilds the world's first bionic man, making him better, stronger, and faster than ever before! Joined by Phil Hester and Jonathan Lau, his collaborators on the critically-acclaimed Green Hornet revival, Smith plunges Steve Austin into a dangerous world of espionage and high adventure. Reunited with Jaime Sommers (of The Bionic Woman fame), Austin must face a maniacal enemy built from deadly technology and dedicated to the collapse of entire nations! Second, Steve Austin, the unstoppable hero of The Six Million Dollar Man, tracks a deadly conspiracy to foreign territory, where he discovers his strangest adversary yet - the legendary Bigfoot! What is this unnatural creature of primal instincts and mechanical parts? What role does the Bionic Man play in the monster's origin? If one such Bigfoot exists, could others still roam the wilderness... or be manufactured on an assembly line? Also, Steve Austin has a tearful reunion with Jaime Sommers. How will he react when he discovers a terrible truth - that he may have unwittingly been responsible for the tragic accident that transformed her into the Bionic Woman, and erased her memories? Third, Steve Austin, the iconic hero of television's Six Million Dollar Man, faces new threats both foreign and domestic! When the brutal dictator of Libue threatens to use whatever means necessary to squash the rebels of his wartorn nation, the American government sends the Bionic Man to prevent the detonation of nuclear missiles on millions of innocents. Meanwhile, the Office of Scientific Intelligence is under siege by rogue agents. Will Austin's close friend and OSI handler Oscar Goldman survive an attack on his life... and a mechanized terror with a face all too familiar?